With December getting closer and closer, I felt it was only appropriate to break out the glitter and go for a full on frozen look for my nails this week. Layered over Sheraton Street, Nails Inc Diamond Arcade is one I've wanted to pop on for quite some time. If you haven't came across Diamond Arcade before, it's part of the Special Effect range from Nails Inc to add a little something extra to your nail polish look. 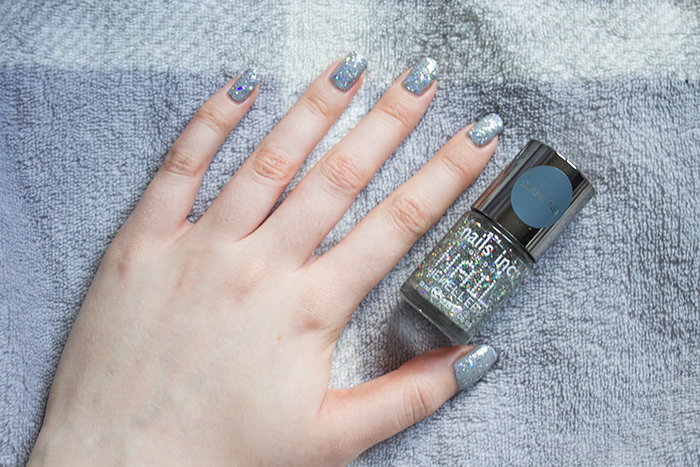 The glitter top coat is described as nail jewellery with hand cut particles. Due to the hand cut nature, the fragments are all different shapes from chunky to small to give a great range of texture. It makes it a little more special than your average glitter polish but it does take a little more time applying to get the perfect finish. As it's a glitter top coat, a base colour is essential. I thought about a plain white base but I ended up settling on Nails Inc's Sheraton Street, a gorgeous icy blue shade which goes perfectly. The polish lasted very well on the nails for a full week's wear so I'll definitely be popping this combination on in the future. Slightly expensive for a top coat but I can't deny the gorgeous finish it gives.